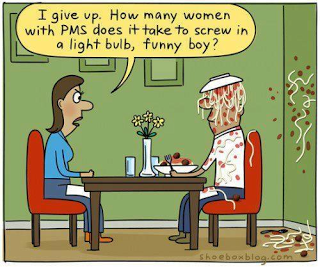 Signs that you may have PMS. * You can toast marshmallows with your breath. *Your default response to EVERYTHING is… fuckoff and die. *Your secret chocolate stash looks like it was ransacked by Bigfoot, except it was actually you. *Everyone in the house including the dog are wearing crucifix’s. *The snowman is reduced to a puddle when you walk by. *Your only emotion is RageSobLaugh simultaneously. *You roll Prozac in chocolate, because you’re desperate. *You consider slitting a biker dudes neck with your hang nail because he’s in your way, but you spare him when you remember there’s no chocolate in the Big House.